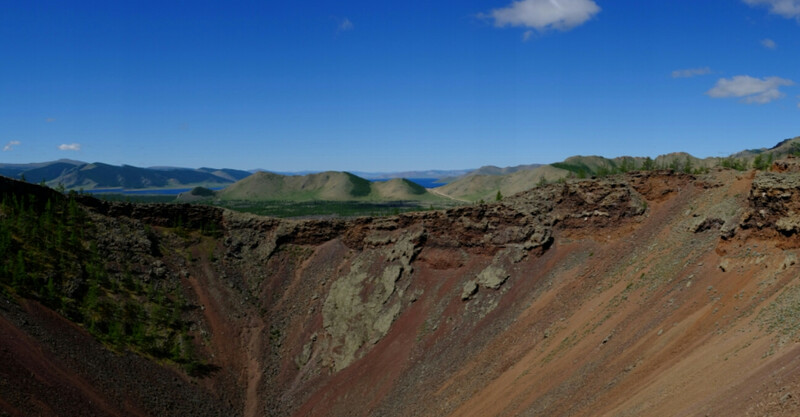 Khorgo crater ( Khorgo Togoo ) is located 180 km from Tariat soum in Arkhangai Province, at the edge of Terkh Tsagaan Lake was a volcano that erupted 8,000 years ago. It cover 50 square kilometers and 2,210 meters above sea level. The Khorgo Crater (Khorgo togoo) is 200 meters wide and deep 80 meters. A thick cedar forest grows there. There is a cave known as the “stone ger” by locals near Khorgo Crater. The cave was made of hot lava that turned to stone. There are over 10 caves with holes like you would find at the top of a ger and acting as doors. More than 33 small and big craters near by Khorgo crater such us Ul, Tsagaan-Uul, Zalaa Mountain, Mandal and Shavar Tsaram and more. Between them, the Suman, Gichgene, and Chuluut rivers bubbling flow makes our land one of beauty. Please let us know everything you have. Your comment will help us a lot to improve this content.